On Sunday February 22nd, Amy participated on a panel discussion, Art in the 21st Century- Expanding the Artist's Role. The other panelists included Joseph Meisel from the Mellon Foundation; Beth Wilson, art critic and history professor at SUNY New Paltz and Brian Wallace, Curator at the Dorsky Museum. The panel was moderated by artist Simon Draper and held at Van Brunt Gallery, Beacon, NY in conjunction with the Habitat for Artists exhibition. The gallery was filled to capacity. One topic of discussion was the reaction to Holland Cotter's NY Times article, "The Boom is Over. Long Live the Art" and the heated response elicited from it both positive and negative. Many artists argued that they already have "day jobs" - always have had them and didn't like being told it was day job time again. Brian Wallace wondered why it falls to the artists to be the do-gooders in communities when hard times hit? 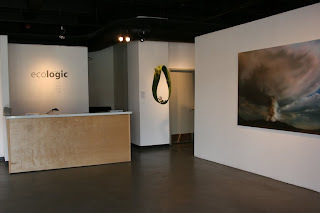 Artist Susan Magnus spoke about the fact that many artists are involved in "real world" issues whether their work reflects those issues or not -that the idea of the isolated artist, alone working in the studio is no longer relevant. One positive suggestion was for artists and creative "think tanks" to emerge. Artist Karen Dolmanist spoke about her work reflecting her core values of sustainability and contemplation as opposed to market based values. Beth Wilson spoke about the possibility of heterotopias, as defined by Michel Foucault in a 1967 lecture. In this lecture, Foucault sketches out a notion of how certain spaces exist for the negotiation of power relations, - places where for various reasons, individuals are set aside from the mainstream of everyday life. In the act of this setting aside, there is inscribed a “web of relations,” according to Foucault. 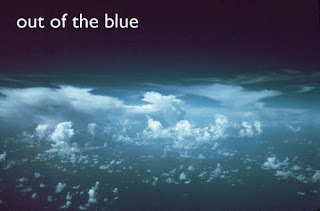 ecoartspace has been championing ideas related to the web of existence as per ecological systems, collaboration, collectivity and sharing for nine years now and they haven't been as popular during the boom - maybe the recession will be a good time for us? 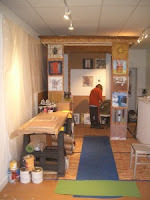 Since ecoartspace is opening a new project room next week in NYC -we certainly hope so. The Habitat for Artists Collective project is an exciting beginning to this chapter. HFA artist Chris Albert captured the event live and it can be watched on his blog, MAYKR. Also catch Sharon Butler's "share and share alike" on collaborative and community based art on the Art 21 blog. Mother Nature Network's Chuck Leavell, Director of Environmental Affairs and Michael Lindsay, Multimedia Producer. MNN.com is a new website that provides environmental news and information, they describe themselves as a "one-stop resource and an everyman's eco-guide offering original programs, articles, blogs, videos, and how-to guides along with breaking news stories." Chuck Leavell, MNN's Director of Environmental Affairs, is a committed environmentalist, and author of Forever Green and The Tree Farmer. He has been the keyboardist for the Rolling Stones since 1972 and was previously a member of the Allman Brothers Band. Leavell has also played with Eric Clapton, The Black Crowes, George Harrison, The Allman Brothers Band, The Indigo Girls, and many, many more. The interview took place in Beacon, NY at the Van Brunt Gallery where Draper's current collaborative project is on view, Habitat for Artists. 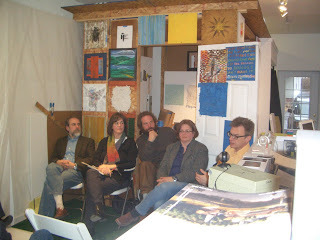 Lipton spoke about ecoartspace's mission and history including projects in New York City and the Hudson Valley. She made the point that the modern environmental movement began here more than 40 years ago, when Scenic Hudson was formed as an organization to protest the planned blasting of Storm King Mountain by Con Edison. Scenic Hudson won that battle and continues to fight for land and habitat preservation along the Hudson river and beyond. It is also not a surprise that the Hudson Valley was the birthplace of the first American art movement, The Hudson River School, when 19th century artists made paintings depicting the extravagant beauty of what was then still mostly pristine wilderness - though the encroachment of industry had already begun via the train line. Some of the Hudson River School artists were reacting to environmental degradation in their time and the tradition has held. This early example of the merger between art and conservation has inspired many contemporary proponents of ecological art, and that's where ecoartspace comes into the picture. Simon Draper also spoke with Leavell and crew, taking them for a stroll in Beacon to see a few of the remaining habitats (outdoor art studios) created by the Habitat for Artists collective last summer (see earlier blog post). 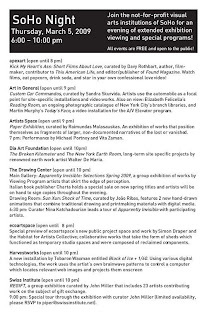 HFA will open with a new project at the ecoartspace NYC office on March 5th (more to come). This meeting was facilitated by Gwendolyn Bounds, author of Little Chapel on the River and Wall Street Journal writer, who also spoke with Lipton and Draper at length about their current joint project. 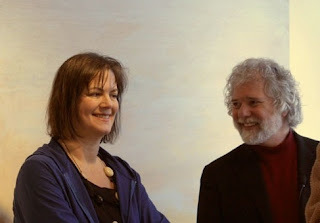 ecoartspace has been the sponsor of HFA activities since summer 2008.
images: Chuck Leavell and Amy Lipton (top), Simon Draper and Gwendolyn Bounds.